Blair Candy Is Going Green And Saving You Green! At Blair Candy, we have been working to improve the eco-friendliness of our business, and we’re excited to announce that a greener Blair is now in full swing. We have always found our French Burnt Peanuts a tastier side of our company than our packing peanuts, but we weren’t sure how to work around their necessity for helping your candy and snacks arrive safely…until now! Planet-friendly packing paper is what you’ll now find inside that box, as well as delicious delights, of course. 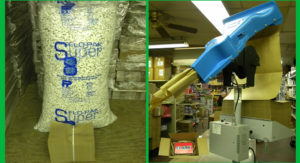 We do still rely on packing peanuts for a small selection of heavier orders, but our Big Green Paper Packing Machine is now the hardest working piece of equipment in the warehouse, sending 60% recycled paper your way instead of a pile o’ peanuts. And what better holiday to really roll out our new packing material with than St. Patrick’s Day! Green candy packed with ‘green’ paper…can it get any greener? Actually, it can get less green, by saving you some green! We’re offering 10% off ALL OUR CANDY in celebration of St. Patrick’s Day (and the BGPPM) now through March 1, 2010. The Gummy Candy will seem gummier, the Lollipops lolli-poppier, the Jolly Ranchers even jollier, because saving money on something as fabulous as candy packs some power. And of course, you’ll want to get your hands on the gold at the end of this reduced price rainbow – St. Patrick’s Day Candy! We have Shamrock Bubble Gum Coins, Green Apple Tootsie Frooties, Mean Green Blow Pops, and so much more. The Luck O’ The Irish is with your wallet every click of the way, saving you 10% here, 10% there, 10% candy everywhere! Sorry…I get excited. This *is* sugar and a sale we’re talking about. Who knew green could taste sooooo good?! Before I go, I’d like to leave you with a favorite Irish saying – “The future is not ours to know, and it may never be – so let us live and give our best and give it lavishly!”. I’m no expert, but I’m pretty sure that means we should eat more candy. 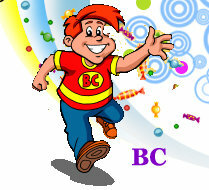 Captain Candy, BC and Goober – Getting To Know Them! You may have noticed a few fantastically fun characters hanging around the Blair Candy site, and we wanted to formally introduce you to our new friends. 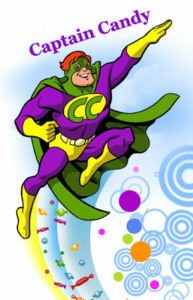 The man behind the mask is the one-and-only Captain Candy, protector of all things decidedly delicious! His favorite job at Blair Candy is choosing his Candy Deal Of The Day! from our extensive candy collection. And the magic candy bar riding duo is BC and his cute-and-cuddly sidekick Goober, a terrific team whose love of sweets is only surpassed by their own sweetness! These three seem to travel together, and we couldn’t be happier that they found their way to our door. A smile is never far away when Captain Candy, BC and Goober sweep in, and we’d love for you to come to know them as well as we have. They’d love it, too, and have shared some fun facts about themselves! Let’s take a peek, shall we? 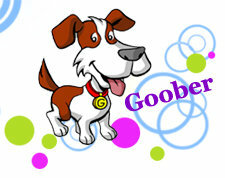 Favorite Color: Brown and White together – like my best friend Goober! Captain Candy, BC and Goober are sure to back to the blog soon, and we know you’ll come to consider them friends. But if you have any questions for them in the meantime that they haven’t answered, ask in the comments and we’ll get those to them ASAP! What’s Even Sweeter Than Free Shipping? Great Prices On Great Candy! We understand the enticement of free shipping – it even has the word ‘free’ right in there, and who doesn’t love free things?! But one of the things we pride ourselves on at Blair Candy is being fair to our customers, and we don’t think it’s fair to raise our prices to absorb shipping costs just so we can give you something for ‘free’ when in fact, you’d be paying for it. The simple truth is that shipping costs money. We wish as much as you did that it didn’t, but we aren’t going to try to ‘sugarcoat’ the truth. We sell Moon Pies, not white lies! Blair Candy was born with the old-fashioned corner candy store in mind. We wanted to bring everyone back to the way it felt to have a quarter in your pocket and an ‘Open’ sign on the candy store door. 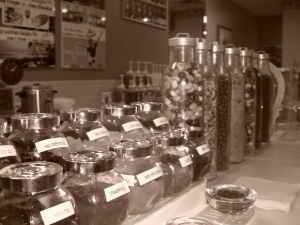 A time when there was a smiling face behind a glass case full of Bottle Caps and Boston Baked Beans. A time when the day was made the best it could be with a little brown bag full of treats in one hand, a bottle of Coke in the other, and a slow walk home in the summer with friends. No, we aren’t magicians, and we can’t turn back time! We also can’t show every customer that we are indeed smiling as we pack up their box of Penny Candy memories. But we can be 100% honest about costs. Our candy prices are for the candy. Our shipping prices are for the shipping. And we’ll always be more interested in stretching taffy than the truth! Your Sweet Tooth Just Got Even Sweeter! There’s no arguing the deliciousness of Christmas Candy, with it’s flurry of cute Santa shapes and perfect pepperminty goodness. And there’s no arguing the excitement of Easter Candy, with bountiful beans of jelly and ‘egg’cellent options at every candy twist and turn. But it’s that holiday in the marvelous middle of the two that brings happy hearts, fabulous foil-wrapped temptations, lick-your-lips lollipops, and enough pink and red packaging to make all other colors pack up their candy bags and head home. And that holiday, of course, is Valentine’s Day! As you might imagine, we get a tad bit excited when Valentine’s Day rolls around at Blair Candy. The boxes of sweets have barely made it past our door before we’re tearing them open and staring wide-eyed at the heaping piles of Conversation Hearts, mouth-watering mountain of Andes Creme De Menthe, and perfectly puffy Marshmallow Peeps Hearts. Yes, Valentine’s Day is quite a Mmmmagnificent holiday!